A real home has as much personality as the people who live there. That’s why we’ve made Mill House a place you’d be proud of and happy to live in – just as you would your own home. Excellently situated, Mill House Care Home in Witney, Oxfordshire is centrally located near to all of the market town’s amenities, including shops, restaurants, a cinema and the tranquil church green. Our home is set across three floors, and there are communal lounges and dining rooms on the ground floor, as well as a lovely garden, meaning peace and quiet is never far away. Every brighterkind home now has a Magic Moments Club which provides a vast range of activities and fun things to do that are open to all of our residents. The idea behind Magic Moments is that just because someone moves into a care home doesn't mean that the things they love doing should suddenly stop – quite the contrary, we believe our residents should have the opportunity to love every day, by doing the things that they have always loved as well as trying new things along the way. Magic moments are unique to each individual and so it is important that the Magic Moments programme reflects this, tailoring activities to meet each resident’s individual needs in the best possible way, whilst at the same time enjoying the company of others. Our Magic Moments Club Co-ordinators, get to know our residents really well and will seek to provide an ever-changing programme of events and activities tailored to the needs of our residents and aimed at improving their wellbeing in terms of their mind, body and soul. The Magic Moments Club team run a ‘Welcome to the Week Meeting’ for our Residents and families so that everyone knows what is coming up and can start looking forward to their favourite Magic Moments! Our daily and weekly Magic Moments Club programmes are posted on our notice boards and residents and their families can take part as they wish. We also run monthly Magic Moments Club themed events where we encourage families and our local community to take part. 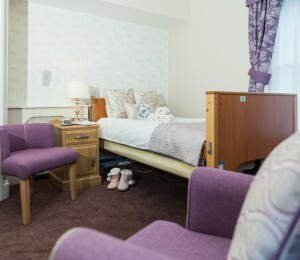 With 34 bedrooms offering residential and nursing care, we think carefully about the type of room each resident needs. All the rooms are en-suite with toilet and wash basin facilities. There are bath and shower rooms on each floor for residents to use with or without assistance. Half of our rooms are located in the renovated part of the building meaning they’re filled with period features and vary in size. The other half are newer rooms of a standard size, as well as three larger bedrooms. All our rooms are finished to the highest specifications with new furniture, soft furnishings and fittings. We have designed the rooms with your comfort in mind. Your bedroom furniture consists of: an appropriate bed suitable to your needs, wardrobe, bedside table with lockable drawer, armchair and other furniture suitable to the size of the room. Your bed linen and towels are provided by the home. We understand that moving into Mill House will be a considerable transition, but one we try to make feel as easy as possible. Your room is your own personal space, which is why we encourage you to personalise it if you like, by hanging your favourite pictures or bringing small pieces of furniture.